Magnetized-beam plasma propulsion, or magbeam propulsion, could cut the time required for long journeys around the solar system from years to weeks. The MagBeam propulsion system is being developed at the University of Washington; earth and space sciences professor Robert Winglee is leading the project. "We're trying to get to Mars and back in 90 days," Winglee said. "Our philosophy is that, if it's going to take two-and-a-half years, the chances of a successful mission are pretty low." People usually think of a spacecraft as a ship with both payload and power source. The MagBeam system separates these two logical units; the power source stays in one place (for example, in permanent orbit around the Earth). Spacecraft are pushed to other parts of the solar system. One power source could be used to power multiple craft (serially, not at the same time). The power source could use solar energy, resulting in additional cost savings. Plasma propellants are accelerated to speeds an order of magnitude greater than those achieved by chemical rocket propellants, resulting in higher spacecraft velocities - at least 26,000 miles per hour. A round trip to Mars would take 2 1/2 years using current technology. If the trip time could be shortened, many other difficulties (like the quantity of consumables and the psychological effects on the astronauts) could be greatly eased. The system requires a power source at each end of a journey; one to accelerate the spacecraft at the start and another at the destination, to decelerate it. The spacecraft simply coasts during the journey from planet to planet. Once MagBeam power sources are placed at destinations around the solar system, the system can be operated using solar power alone. 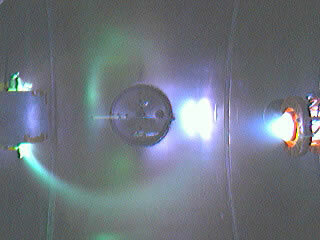 MagBeam depends upon a highly collimated plasma beam. The high power helicon (HPH) under development at the University of Washington is a state-of-the-art electrodeless plasma thruster, which allows high power levels to be generated over long periods of time with little erosion of the system. 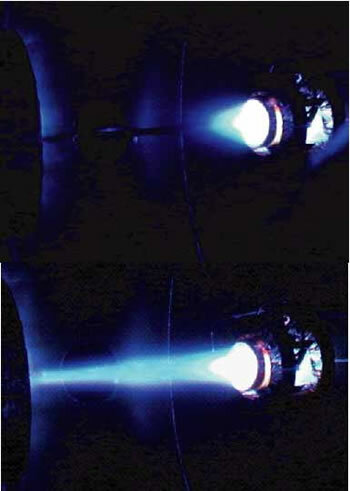 The plasma is generated by high power radio frequency waves; as a result, HPH is substantially smaller than other plasma thrusters. The spacecraft will need to have a deflector system to accept the energy from the HPH. 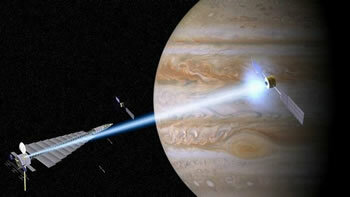 This can be achieved by plasma magnet systems; plasma effects are used to make an initially large magnetic deflector. The system is self-focussing. Click to see a video showing deflection and self-focussing. So when can we expect a MagBeam test mission? According to Dr. Winglee, within 5 years if funding remains consistent. Residents of Seattle can attend the NASA Advanced Concepts Institute meeting early this week to learn more. The idea of separating the spacecraft and its payload from its power source was first explored in science fiction in the excellent 1974 novel Mote in God's Eye, by Larry Niven and Jerry Pournelle. In the book, a battery of laser cannon were used to accelerate a small ship with a light sail to a significant fraction of the speed of light. The original idea for a laser-based propulsion system is credited to Robert L. Forward and dates from 1961. You may also enjoy this article on Solar Windsurfing; it provides an interesting precursor to the idea of laser cannon. See the original article New propulsion concept could make 90-day Mars round trip possible.